After years of development in the desert north of Los Angeles, a gigantic, six-engined mega jet with the wingspan of an American football field flew Saturday morning for the first time. “We finally did it,” said Stratolaunch Systems CEO Jean Floyd at a news conference from the hangar at Mojave Air & Space Port. 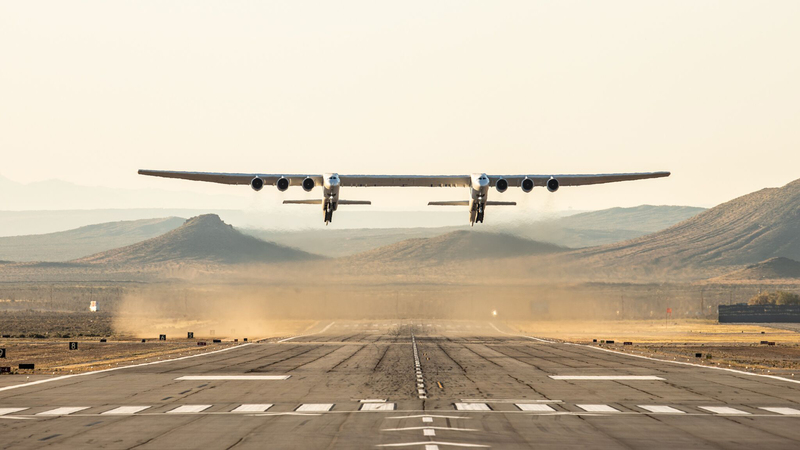 “It was an emotional moment to watch this bird take flight.” Stratolaunch, the company founded in 2011 by the late Microsoft co-founder Paul Allen, conducted the first test flight of the world’s largest plane. “I had imagined this moment for years, but I had never imagined it without Paul standing next to me,” Floyd said, adding that he whispered a private “thank-you” to Allen as the plane took flight. Allen died last October at age 65 from complications related to nonHodgkin’s lymphoma. In simple terms, the Stratolaunch aircraft is a giant flying launch pad, designed to hurtle satellites into low Earth orbit. It aims to offer the military, private companies and even NASA itself a more economical way to get into space. The company’s business model calls for getting satellites into space “as easy as booking an airline flight.” Test pilot Evan Thomas flew the jet to speeds of about 173 mph, climbing as high as 15,000 feet before returning smoothly and safely back, after a nearly two-and-a-half-hour flight.